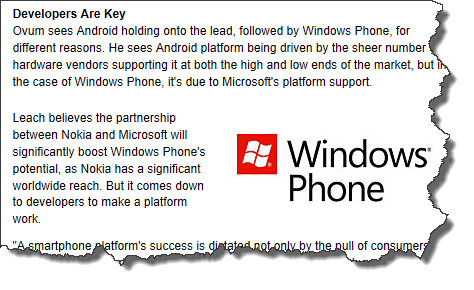 Another analyst/research firm is predicting great strides for Windows Phone. I think this is great momentum for the platform & really exciting for developers who are thinking of investing their time and energy on the platform. I was asked some questions by the author about my thoughts on how the platform is doing and its adoption/growth. Chris Johnson, developer of the My Trips travel app for Windows Phone, said Nokia’s presence is making a difference. “Nokia is certainly stirring a lot of interest in the platform. The excitement over the Nokia push in Europe is helping as well. I’m seeing a lot of growth in Europe and other new markets that are adding the Windows Phone,” he said. Johnson figured his app would eventually plateau, since it’s a niche app. It’s for travel planning and works with TripIt.com. But that’s not happening. “My app sales have stayed relatively high. There is no sign of it flattening out. If anything, it’s accelerating,” he said. This entry was posted in Windows Phone on February 21, 2012 by Chris Johnson.